Almond milk is considered a healthy food by many because the beverage is made from almonds, a highly regarded superfood. But there are ingredients other than almonds in many brands of almond milk, and several different kinds that you can buy. Sweetened almond milk, unsweetened almond milk, chocolate almond milk, and almond coconut milk are just a few of the varieties available and each provides slightly different nutrients and health benefits. There is just one gram of carbohydrate in unsweetened almond milk. Carbs provide four calories per gram, so four of the 30 calories in unsweetened almond milk come from carbohydrate. However, if you buy flavored or sweetened varieties, the carbohydrates and calories in almond milk increase. Unsweetened almond milk has a glycemic index (GI) of 25 making it a low glycemic food. As a reference, foods with a GI of 55 or below are considered low glycemic foods. There are 2.5 grams of fat in almond milk. Each gram of fat provides nine calories so there are just over 20 calories from fat in unsweetened almond milk. 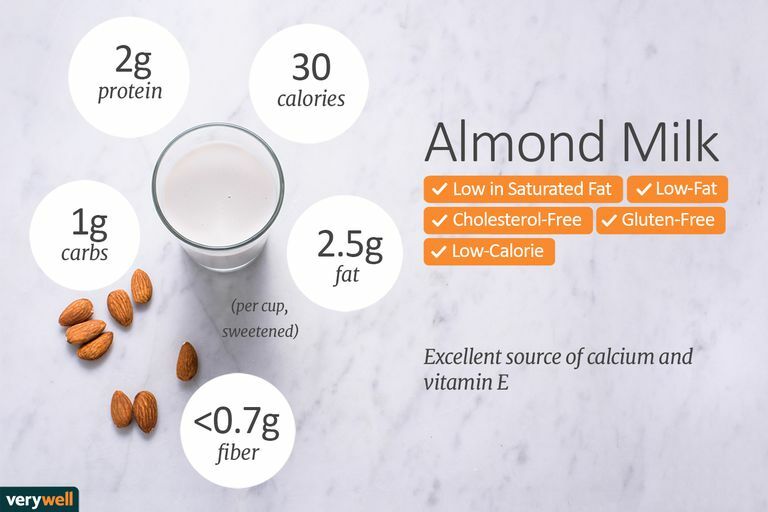 Most of the fat (about 1.5 grams) in almond milk comes from monounsaturated fat while a small part (about 0.5 grams) comes from polyunsaturated fat. Unsaturated fats are considered "good" fats because they may help increase HDL cholesterol levels in the blood and boost heart health. The fat in almond milk does not change substantially based on the flavor that you buy. You'll get just one gram of protein in a cup of almond milk, regardless of the flavor that you buy. Protein helps your body build and maintain muscle. Eating foods with protein also helps your bones, cartilage, skin, and hair stay healthy. As a basis for comparison, one cup of milk provides about 8 grams of protein, regardless of its fat content. A cup of almond milk provides several important micronutrients that will help you to get the vitamins and minerals you need each day. For example, you'll get about 481 milligrams of calcium, or about 45 percent of your recommended daily intake if you follow a 2,000 calorie per day diet. Calcium helps you to maintain strong bones. It is also important for proper muscle contraction and nerve function. As a basis for comparison, a cup of milk provides about 276 milligrams of calcium or about 28 percent of your daily needs if you follow a 2,000 calorie per day diet. Almond milk also provides a healthy dose of vitamin E which plays an important role in cell metabolism. Vitamin E is believed to protect against oxidative stress which may boost heart health and help protect your body against certain diseases including cancer, arthritis, and diabetes. In addition to the benefits you get from the macro and micronutrients in almond milk, you may gain other benefits, as well. For example, almond milk provides a healthy substitute for people who are lactose intolerant or sensitive to dairy and cannot consume cow's milk. In addition, for people who are watching their waistlines, unsweetened almond milk can be a smart way to flavor coffee or enjoy cereal. The calories in almond milk are much lower than many coffee sweeteners and also lower than the calories found in skim, low fat, whole milk. See below for answers to common questions about almond milk. Can I use almond milk instead of regular milk in recipes? You can use unsweetened almond milk as a milk substitute in most recipes (some minor changes in baking time and use of thickening agents may be needed in baking recipes). Use a 1:1 ratio—the same amount of almond milk as regular milk. Opt for the unsweetened variety to avoid unwanted changes in taste and additional ingredients. Does almond milk need to be refrigerated? Most brands of almond milk need to be refrigerated, but there are shelf stable varieties that do not require refrigeration. Look at the carton to see how you should store the almond milk you buy. If you purchase the milk in the refrigerated section, chances are good that you will need to refrigerate it at home. Should almond milk be frozen? No. The best way to store almond milk is in the refrigerator until it's best-to-use-by date. What are the other ingredients in almond milk? Are they healthy? Flavored and sweetened almond milk will most likely contain added sugars. You'll see these listed in the ingredients as "cane sugar," "honey," or as another sweetener. Diet experts advise that we limit our consumption of added sugars to maintain a healthy body weight and blood sugar levels. Almond milk can be a great addition to your morning smoothie. If you usually add dairy milk or water, try using almond milk instead to change the flavor. Try one of these recipes or use one of your own. You can also top your oatmeal with almond milk or use it instead of cream or milk in your favorite creamy vegetable soup recipe. If you have a nut allergy, you should not consume almond milk (or any other nut milk such as cashew milk, etc.). However, according to the American Academy of Allergy, Asthma, and Immunology, if you do not have a nut allergy, it is safe to consume almond milk in the presence of someone who does have a nut allergy. American Academy of Allergy, Asthma, and Immunology. Safety of Drinking Almond Milk in the Presence of Someone With Allergy to Nuts. 2014. Is Coconut Milk Really Healthy? Should You Add Almond Oil to Your Diet? Is Granola Really a Healthy Food? Is Almond Butter a Healthier Alternative to Peanut Butter? Are Chia Seeds Really All That Healthy? Is Drinking Blueberry Juice Good for You? Is Drinking Cabbage Juice Good for You? Is Drinking Passion Fruit Juice Good for You? Is Couscous a Healthy Carb for Your Diet? Is Drinking Celery Juice Good for You?